When I accepted the opportunity to have Descriptions of Heaven published by Harvard Square Editions (rejecting two other small press publishers who wanted the rights to print the manuscript) I set aside a new novel I was working on at the time. I set it aside so I could devote my full attention to, at first, editing my debut and, later, marketing my book. After Descriptions of Heaven came out, I wrote the first drafts to half a dozen short stories or so. As I like to say, all these story ideas were backed up, blocking the creative pipeline. That pipeline is a little clearer now, and I’ve begun work on my novel-in-progress again. I’ve been working on the novel in the new library. The old library was one of the small bedrooms and did have the advantage of a small balcony where one could enjoy a book and a view. However, long-term plans finally reached fruition when my best friend, Mike Convery, moved in. I believe he owns more books than I do. So, Libby and I moved out of our large bedroom and into a smaller room, which had until then functioned as an office. I rather like our new space. It’s cozy and, for some reason, I sleep much better there (my love of tight spaces perhaps?). There’s an entrance to an attic bedroom too from the new library. Since Libs and I gave the room over to a communal space, it opened that bedroom up for her sister to move into last month, just in time for Abby to begin her first year of college classes here in Sioux City. My writing desk is now located in the library since there’s now no dedicated office space. I must say I don’t mind writing while surrounded by all our books (sans those piled in our respective bedrooms, plus a sole bookcase—built by my great grandfather—that sits in the living room, filled with matching hardcover classics). 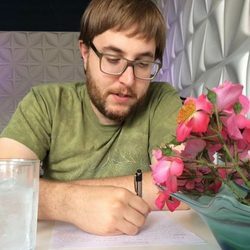 As some of you know, I spent most of my summer writing at the Blue Cafe. I will admit, between sorting and shelving books, vacationing with an artist friend in Virginia, and a belated honeymoon with my wife, I did not make it much to the cafe during the months of July and August. And, as you can see, my desk is lined with post-it notes. They’re organized and essential to have for reference while writing my novel. I simply cannot take all the notes with me to the cafe. If I wrote my first draft on a computer rather than by hand (the pile of paper on the left is the hand-written manuscript) I could use the sticky notes function. However, there’s another reason that I must write here at the desk: the cafe is open only three hours during the day. Yes, I spent most of my summer writing short stories during a measly three hours. With so little time actually writing, I found myself editing at home, reading on the porch, and going on frequent walks and picnics with my new wife—all time spent well in my opinion. But now it’s crunch time. I’m back to writing from morning until early afternoon, usually six hours (including a short lunch). The first thing I am doing is reading through what I’ve written. I have about seven chapters typed up. I’m now reading through those chapters, doing light editing as I go. At the time of composing this blog, I’m in the middle of chapter 4. Ah, but what about those short stories? Will they be seeing themselves in print soon? To answer that question, I’ll say that I still plan to go to the Blue Cafe once a week. You’ll find me there on Thursdays (the only weekday Mike works, which leaves me a little too lonely—I work best in a “studio setting” with the presence of others nearby). At the cafe I intend to work on my short fiction and other non-novel writing, submitting it and editing it, maybe even writing new stories should the impulse to compose be strong enough. Some days I will also spend time on other writing-related work. But not every day. As much as I like the fantasy of a hermetic life of writing, my reality is that I have a lot more in my life to fill up my time. I write, yes, but I also do most of the household cooking, take on the major cleaning projects, keep the houseplants alive, and am essential to shopping excursions. I am a bit of a den mother—even the new members of the household have that figured out already. I’d rather my plate be emptied of some of these duties (essentially the cleaning, as I do love cooking), that way I’d have more time for reading and studying. But, really, I don’t have any concrete complaints. My new roommates have picked up some of the chores. My cooking is now appreciated by more than just Libby and myself. I’ve found I have plenty of time for great conversations with Mike that only supplement my enjoyment of art and books. Somewhere along the line about an hour a day has opened up for me to begin studying Latin again—which is a joy for me because I’m not a natural when it comes to languages, and I love the mental challenge. So things are going well. They’re going great. I have more time than ever to work, learn, and play. My house is full of people I love. My blind dog has more sets of hands to pet her than ever before. And my next novel is well under way. Harvard Square Editions will be doing a Kindle giveaway of Descriptions of Heaven from December 24 through December 28th. Kindle users, please download, read, and review your copy. If you really dig it, buy a paperback for someone you love. Click here to download your free Kindle copy of Descriptions of Heaven now.